← Hey, it’s June and Time to Head for the G.I. Joe’s Portland Grand Prix! G.I. Joe’s offered Christmas shoppers the largest toy selection in Portland in the late 1950s and 1960s. Since this photo is marked 1958, the toy department must have been in the original store on Vancouver Avenue in North Portland. 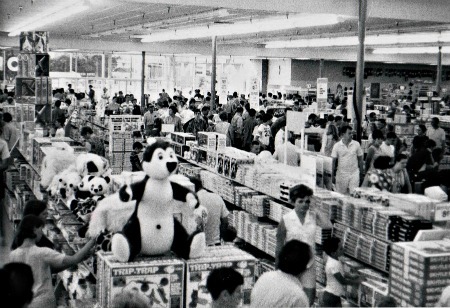 In 1966, Dad opened Store 2 adjacent to the original store and moved Toyland there to coincide with that store opening. When he opened Store 3 in 1968, he again moved the toys there. This entry was posted in original G.I. Joe's store. Bookmark the permalink.